Firefox 4 is all over over the news and the funny thing is, Firefox 4 final release has not even happened yet. Firefox 4 beta 6 was released recently and it boasts of key performance improvements and a number of new and useful features like Tab Candy. 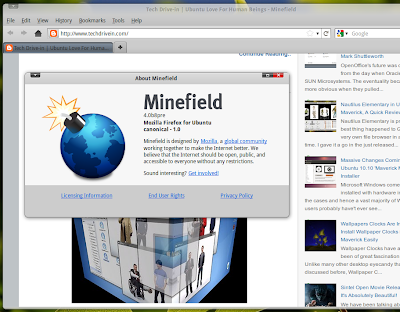 Let's do a quick look at the latest Firefox 4 in Ubuntu 10.10 Maverick Meerkat. With every new beta release, Firefox brings about a ton of changes. Changes might be small and simple, but they are definitely making Firefox an ever more better browser. Notice the url displayed inside text box. Thats how the latest Firefox 4 displays link previews. Whenever you point to some hyperlinks in a website, the preview is shown inside the text box above instead of displaying it towards the lower side of browser. I liked it. Switch to tab feature is meant to reduce the clutter inside the browser. Whenever you try to open a website in a new tab, Firefox 4 will show the switch to tab option as the first result if the website is already accessed in some other tab. And when you choose switch to tab option, instead of opening a new tab, it simple goes to the previous tab. Quite ingenious I should say. 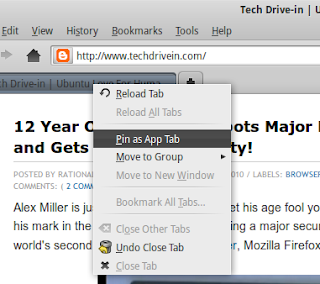 Pin as App Tab is now a default option on ever browser out there, I guess. And it's quite useful too. Also, stop and reload buttons have been merged into a single elegant button. Firefox Tab Candy is probably the best thing happened to Firefox in a long time. Watch the video by Aza Razkin to know what Tab Candy is all about. You might want to check out our previous Tab Candy review as well. 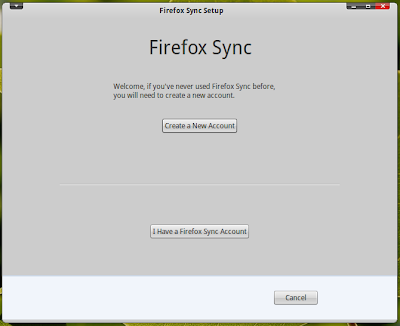 Firefox Sync, as the name indicates, allows you to stay in sync with your Firefox easily. You can access your history, passwords, bookmarks and even open tabs across all your devices. 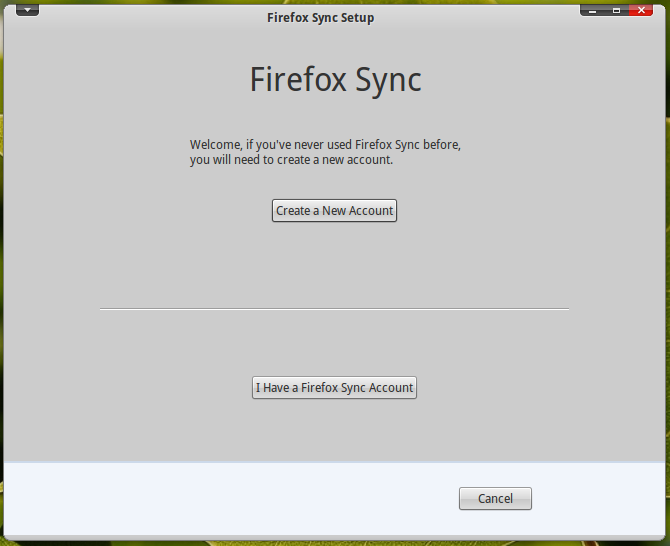 Firefox Sync now comes default with the latest Firefox 4 beta release. You can access it from Tools - Set Up Sync in Ubuntu 10.10. Full changelog here. How to Install Latest Firefox 4 Beta in Ubuntu Maverick, Lucid? Do the following in Terminal to install latest Firefox 4.0 beta in Ubuntu 10.10. Done. Now goto Applications - Internet - Minefield 4.0 Web Browser. Internet Explorer market share is below 50% for the first time and the final Firefox 4 release is only going to speed up the downward spiral. From the initial looks, Firefox 4 definitely feels a lot more snappier and responsive than previous releases. 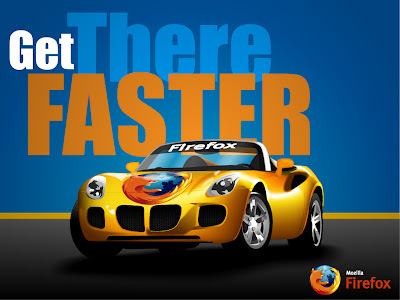 Lets hope for an ever more rocking Firefox 4.0 release.